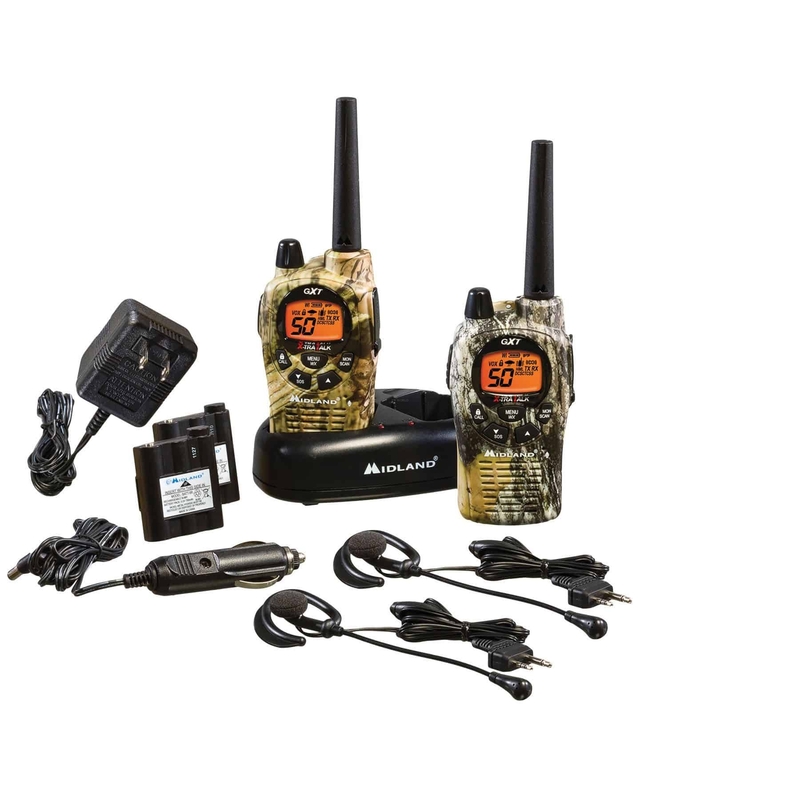 50 Channel, 36 Mile GMRS radio pair with JIS4 Waterproofing protection. Features 284 Privacy Codes (5560 channel options), X-TRA TALK Power (Maximum allowed by law), SOS Siren, Weather Scan, Direct Call, NOAA Weather & Alert (weather/hazard), 10 Call Alerts, eVOX (9 Levels), Channel Scan, Dual Watch, Vibrate Alert, Auto Squelch, Keypad Lock, Whisper (Allows you to whisper and the receiving radio hears it at full volume), Monitor, HI/MED/LO Power Settings, Roger Beep, Silent Operation, Bright Backlit LCD Display, Keystroke Tones, Mic & Headphone Jacks, Battery Life Extender, Drop-in Charger Capable, Dual Power Options (uses standard AA  or rechargeable batteries). Comes with Belt clips, Desktop charger, Rechargeable batteries, AC wall adapter, DC Adapter & Boom Mic Headsets. In Mossy Oak Camo.